Modern music listening ear plugs have exploded onto the ear plug world over the past ten years or so, giving everyone, from casual music lovers to professional stage musicians an increasingly wide choice of ear plugs that let you choose the amount of sound reduction you experience, while still letting you enjoy the full experience of the music you love. With music listening ear plugs, only the volume is reduced - not the fidelity. For professional musicians and music lovers who want a great fit and the maximum in sound quality, we highly recommend full custom musicians ear plugs. We offer three models found near the bottom of this page: Westone Tru, Westone Style ES49, and Perfect-Fit CMP Model Custom Musicians Ear Plugs. 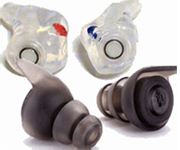 (NRR 11) MusicMinders Ultra Filtered Foam give you clear hearing and hearing protection in an inexpensive foam design. These ear plugs are ideal for music students, school bands, and anyone who wants to avoid ringing ears after a concert. Got Ears? School Band Musicians Ear Plugs Assortment Pack is a collection of natural sound ear plugs specifically chosen for school age kids from middle school through high school who will participate in school or extra curricular band practice and performance. (NRR 32) Hearos Dazzlears Fashion Bling Ear Plugs are soft, pink, and sized to fit smaller ear canals. Each plug features a radiant rhinestone, so you can stay safe and look stylish. Powerful noise protection makes these strong enough for clubs, concerts, sleeping, NASCAR, shooting, and more. EarDial Ear Plugs for Live Music are so discreet, low-profile, and transparent that they're practically invisible. EarDial allows high-fidelity hearing with no distortion, while protecting against hearing damage and ringing ears. Comes with free phone app to measure sound levels. Sleek, compact aluminum carry case. (SNR 35) ISOLATE MiNi Aluminum is the revolutionary first solid metal ear plug, in a smaller size. ISOLATE's dense metal body reflects sound away from the ears, providing very good protection from noise and allowing clear hearing. Perfect for concerts and clubs. Crowdfunded on Kickstarter. (SNR 35) ISOLATE Aluminum is the revolutionary first solid metal ear plug. ISOLATE's dense metal body reflects sound away from the ears, providing very good protection from noise and allowing clear hearing. Perfect for concerts and clubs. Crowdfunded on Kickstarter. Alpine PartyPlug Pro Natural Ear Plugs let you hear sound naturally and clearly, while keeping your ears safe at concerts and clubs. Low-profile, transparent, discrete design. Comfortable enough to wear for hours. dBud Ear Plugs have an adjustable volume slider that lets you switch between two modes of protection with just a fingertip. No need to remove the ear plugs to change volume settings. dBud allows for clear, crisp hearing, making these earplugs perfect for music and concerts. No batteries required. (SNR 36) ISOLATE PRO Titanium is the ideal material for the revolutionary first solid metal ear plug. ISOLATE's dense metal body reflects sound away from the ears, providing excellent protection from noise and allowing clear hearing. Perfect for concerts and clubs. Crowdfunded on Kickstarter. (SNR 36) ISOLATE PRO MiNi Titanium is the ideal material for the revolutionary first solid metal ear plug, and comes in a smaller size. ISOLATE's dense metal body reflects sound away from the ears, providing excellent protection from noise and allowing clear hearing. Perfect for concerts and clubs. Crowdfunded on Kickstarter. (SNR 36) Flare Audio ISOLATE Special Edition Gold-Plated Ear Protectors provide solid metal protection from noise while preserving clear, natural hearing. Perfect for concerts. Plated with stunning 24 carat gold. (SNR 36) Flare Audio ISOLATE Special Edition Rhodium-Plated Ear Protectors provide solid metal protection from noise while preserving clear, natural hearing. Perfect for concerts. Luxuriously plated with Rhodium, the rarest metal in the world!